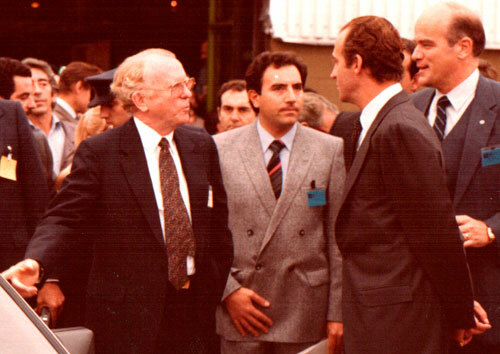 En la inauguracion de la planta de GM en Zaragoza con Su Majestad el Rey de España; Roger B. Smith, Presidente de General Motors y R.C. Nerod, Presidente de Opel. My name is Antonio Caetano. I was born in Spain. Graduate in Nuclear Physics and Official of the Spanish Navy. My specialty is working with large companies in the Communications and Public Relatios Department, in order to define and establish a Strategic Plan to achieve, among others objectives, a perfect image of good corporate citizenship. From 1978-1992 I have worked in four large U.S. and Swedish Corporations: 3M, General Motors, Citibank and Electrolux. I began in 3M Company in the eighties, when it was expanding nuclear products in the spanish market, and I attended training in Minnesota and Washington. Next, as General Motors began its automobile production operations in Spain, I was hired to design and implement the “Social Immersion Program” and again I attended training in USA, this time in Chicago, Detroit and New York. Five years later Citibank / Citicorp decided to begin its financial operations in Spain and I was hired to do the same job and to accomplish the same goals. Again, training took place in USA, in New York. The process, apart from special aspects of each one of the 3 mentioned businesses, is very similar, and has to be early started (in parallel to the construction phase): 1-to make a full study of corporate Vision and Mission, 2- to prepare a survey of activities and social reactions in other countries, 3-to define, design and implement a Communication & Public Relations Strategic Plan, specific to spanish reality, in order to spread the main messages among its target, both internal and external public. The Strategic Plan should be designed for sliding along 3, 6 and 9 years. I conducted seminars of Enterprise Deployment in many Universities all over the world. From 1992-2010 I worked as Quality General Director in Renfe (spanish railway). As a result of my collaboration with these companies, Their Majesties the Kings of Spain granted me the Golden Medal of the Iberoamerican Summit of Heads of State and Govenment, held in Costa Rica in 2004, "For his exceptional contributions to the Managerial Improvement". Feel free to contact any person related to 3M, General Motors, Opel Citibank, Electrolux, Renfe or Fundibeq. I also may provide you with more references, upon request.